Despite beginning his speech in Nepali, acknowledging Lumbini as Gautam Buddha’s birthplace and reuniting Jeet Bahadur with his family, Prime Minister Narendra Modi’s Nepal visit was an absolute failure in terms of everything India wanted to see him achieve. People in India as well as Nepal expected from PM Modi that he would break with the old tradition in India-Nepal relationship where Nepal always has to play younger brother role and usher it in an era of equality opportunity. Sadly, as at home he couldn’t deliver abroad. His maiden speech in the Constituent Assembly of Nepal was worst ever speech by a visiting head of any country in any host country. It was more of a sermon than a clear cut diplomatic statement, which every one rightly expected. PM Modi was expected to fill the holes which consecutive Indian governments had dig in in Indo-Nepal relationship but he, like his predecessor Dr. Manmohan Singh, ended up adding more! Narendra Modi did well to begin his speech in Nepali but failed to keep the momentum. Initially it appeared that he was one who was free of big brother syndrome, which Indian leaders generally carry, but two-three sentence later he shed his mask of humility and started coaching Nepali parliamentarians on his favorite topics: religion, history, management and mostly importantly himself! What India badly needed in Nepal was an image makeover. For whatever India does in Nepal is always seen with suspicion. Suspecting everything India does in Nepal is the default setting in a Nepali mind. So PM would have done better if he would have come out of his election mode and talked business. After all he wasn’t there to influence voters! 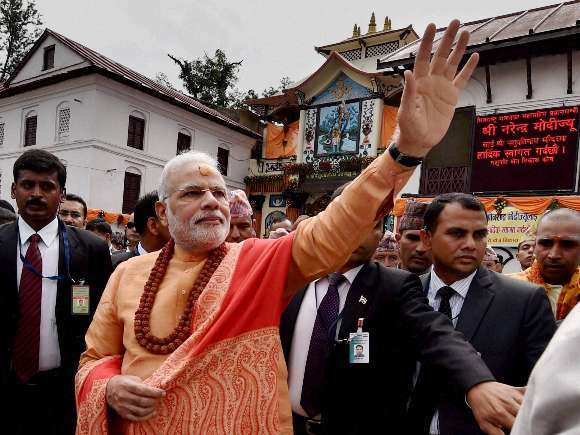 The first blunder that Modi made was to unnecessarily evoke gods to describe Nepal’s relevance. Doing that, he ignored the feelings of non-Hindu population of that country. He wasted many minutes of his 45-minute long speech to explain how his coming from Somnath and winning election from Kashi (Varanasi) brought him closer to Pashupati (Nepal)! Further he wrongly claimed that 125 crore Indians want to visit Pashupatinath temple! In his enthusiasm to impress or impress upon Nepali parliamentarians, half of whom are Communists, he forgot to minus Muslims, Christians, Sikhs, Dalits and other minorities of India and Nepal from that number who are barred from entering the elite temple. In the gate of the temple it is written in bold, ‘Non-Hindus are not allowed inside the temple premise’! Moreover, even Nepalis do not relate themselves to Pashupatinath. It is Gautam Buddha who is the real national symbol in Nepal. Ask any Nepali there, the first thing he would like a tourist to see in Nepal is Lumbini, the birth place of Buddha. PM Modi would have done better by congratulating Nepal on becoming a secular democratic country. It is again a diplomatic blunder to try teaching leaders of host countries what they should be doing. In half of his speech he did this. To add on to it, he told the members of the Constituent Assembly that they didn’t know what they were actually doing! He spoke as if those men and women didn’t understand the meaning of constitution writing. Once he even said, ‘you think you are doing this but actually you are doing that’. The PM would have really done well had he talked about the process of Indian constitution writing. It was an opportune moment to remember Dr BR Ambedkar, the architect of Indian Constitution, and the challenges he had to overcome to write it. And, also what features of Indian constitution played important role to keep India stable and on the path of social justice. It would have definitely given the Nepali law makers some food for thought. But our PM ignorantly mixed modern constitution with the ancient Hindu texts! Rather suggesting them to have saintly and priestly mind, he could have suggested them to have scientific and rational attitude. It makes one wonder if our PM really don’t know anything beyond the Ganges, gods, Hindu religion and of course himself. He didn’t once mention any great Nepali leader or literary figure. Compare his speech with the US President Barak Obama’s in the Indian Parliament and readers can easily spot the differences. President Obama spoke about Mahatma Gandhi and Rabindranath Tagore. He evoked both to highlight the importance of equality, human dignity and social justice. In contrast PM Modi could only stereotype Nepalis as shedding blood in India’s wars and belonging to the country of Lord Pashupatinath. President Obama genuinely recalled the roles of his predecessors in building relationship with India. PM Modi, in contrast, negated the roles played by the likes of Jawaharlal Nehru, Indira Gandhi, IK Gujral and others in bringing India and Nepal closer. It wouldn’t have left bad a taste had he talked about Jayaprakash Narayan, Chandra Shekhar, VP Singh and other Indian leaders who always associated themselves with Nepal’s democratic movements and who Nepali people still fondly remember. But no, Modi can’t do this. His ego is too big to see anything beyond himself. With this attitude, Modi will never achieve what he intends to achieve. He can never be the South Asia’s leader he aims to become and who the region badly needs. This entry was posted on August 6, 2014 at 5:03 am	and is filed under India, Nepal. Tagged: Baburam Bhattarai, Barack Obama, CA Nepal, India, Narendra Modi, Narendra Modi in Nepal, Nepal, Pashupatinath Temple, United Communist Party of Nepal (Maoist), Vishnu Sharma. You can follow any responses to this entry through the RSS 2.0 feed. You can leave a response, or trackback from your own site.